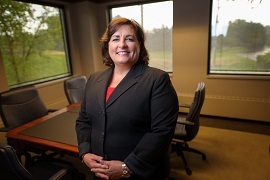 Beverly Sandacz is a principal in the firm’s medical defense group. She has devoted her career to the defense of hospitals and health care providers, including physicians, nurses, and therapists. She also serves as counsel for hospitals and health care insurance companies. Ms. Sandacz has handled literally hundreds of medical malpractice cases from inception, with a history of defense verdicts as lead counsel across northern Ohio. Ms. Sandacz has also lectured to physicians, nurses, and lawyers on medical malpractice issues. Ms. Sandacz also served as judicial staff attorney for the Honorable Joseph Mahoney at the Eleventh District Court of Appeals from December 1993 to August 1995. Prior to becoming a lawyer, Ms. Sandacz worked as a registered nurse for ten years in Virginia and Ohio. Her areas of practice included cardiac step-down, surgical intensive care, and cardio-thoracic intensive care. Ms. Sandacz has achieved an AV® Preeminent ™ rating from Martindale–Hubble Law Directory. She is also a proud Fellow of the Cleveland Metropolitan Bar Foundation, a leading law-related charity in Northeast Ohio.